Zombie Ice Man is HUNGRY! And Zombie Firebird is feeling peckish too. Mmmmmmm. A Slice of Dr. Betty sounds good ... with a side of Bill, Agent of A.I.M. You really think Deadpool is gonna let that happen? Cue gratuitous violence. 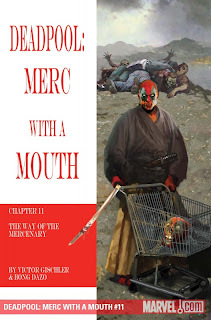 Following Headpool's half-baked plan to get back to the "normal" universe, Deadpool and pals must first fight their way through the hungry of hungries. Which of Deadpool's compatriots gets zombie-fied? Tune in to find out. Same Deadpool-time. Same Deadpool channel.